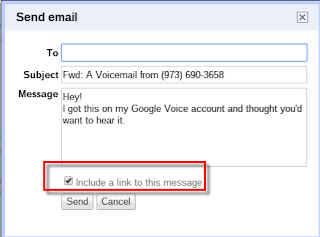 Those of you that are long time, experienced users of Google Voice probably know about this tip. For the others, did you know you can share your voicemail with other people? There are a couple of options for sharing your voicemails: Email, Download and Email, or Embed. In order to accomplish these you will need to get to your Google Voice Page, by going to fi.google.com, scrolling to the bottom and selecting Google Voice. 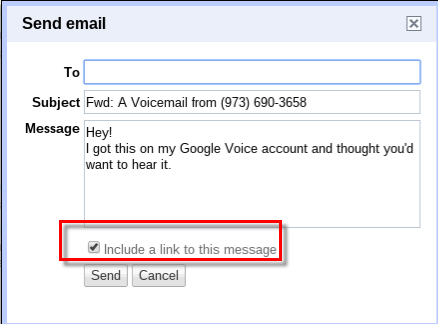 Once on the Google Voice page, navigate to your voicemail by selecting Voicemail from the menu on the right. Once you in Voicemail, find the voicemail you want to share. Click on the More link at the bottom of the voicemail. You will see a few options, but for sharing possibilities you will see Email, Download, and Embed. If you choose download, you will be prompted with where to save the file and what to name the file. The message will be downloaded as an MP3. Once you have the message downloaded you can share the message any way you want, upload to social media, tweet it, email it, save it to a floppy disk, etc. The embed option, will just give you some embedding code that you can add to a website and share the message that way. So, that is all that is to it. Now go share your voicemails with the world. Sweet! Now I can clean up my hangouts. Great, but can I get back the ability to TRULY block someone? You know, where in Google voice they were actually presented with an audio message saying the number was disconnected! The difference is huge! The way Google Fi/Android OS is doing it now simply makes the person think I'm not returning or answering their calls. This original feature of GV helped me actually GET OFF many marketingng call lists! Really deeply upset this is not part of Google Fi! So if I understand it correctly, the only was to "spam" / "block" is to go to the Google Voice page and click "spam"?